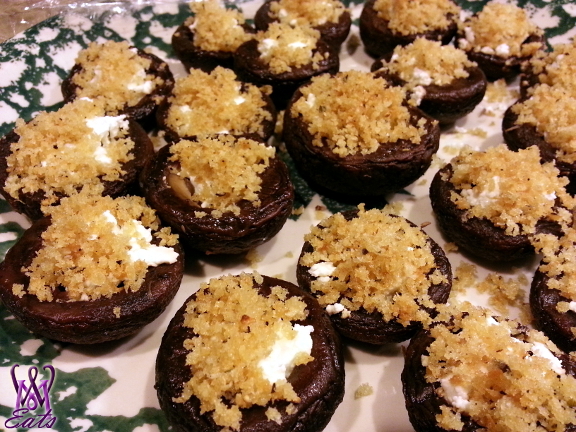 Try this easy appetizer of Goat Cheese-Stuffed Mushrooms from What Micky Eats...At Home. They are great for your next holiday party as they can be made ahead of time and left at room temperature. Goat's-milk cheeses are typically lower in cholesterol, calories and fat—and higher in calcium—than cow's-milk ones. 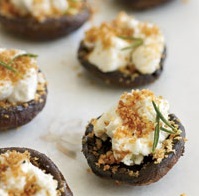 Here, creamy chèvre is stuffed into antioxidant-rich mushrooms and topped with crispy herbed bread crumbs. - In a bowl, toss the mushrooms with 3 tablespoons of the oil and the rosemary leaves and season with salt and pepper. - Transfer the mushrooms to a baking sheet, rounded side up. Roast for about 30 minutes, until tender and browned around the edges. Let cool to room temperature, about 15 minutes. - In a skillet, heat the remaining 3 tablespoons of oil. Add the rosemary sprig and cook over moderately high heat until the leaves are crisp, 30 seconds. - Drain on paper towels, then strip off the leaves. Pour off all but 1 teaspoon of the rosemary oil and reserve it for another use. - Add the bread crumbs to the skillet and toast over moderate heat until golden and crisp, 2 minutes. - Stir in the fried rosemary leaves and season with salt and pepper. 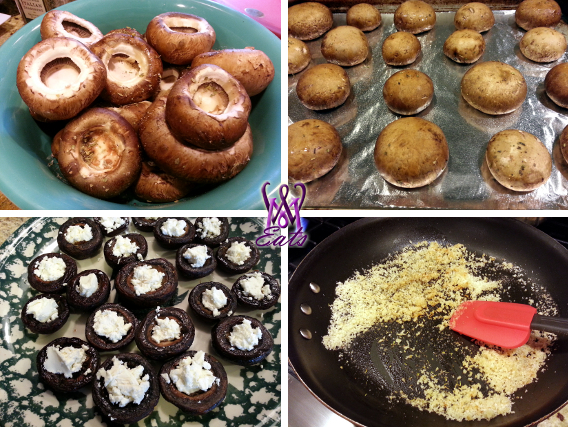 - Gently press a piece of goat cheese in the center of each mushroom, sprinkle with the bread crumbs and serve. The goat cheese–filled mushrooms can be refrigerated for up to 1 day. Bring to room temperature and sprinkle with the bread crumbs just before serving. Remember, you can substitute Italian seasoning for the rosemary.